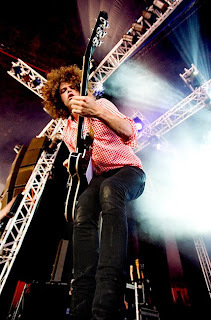 Wolfmother has risen from its ashes like a phoenix and Andrew Stockdale is working on a new album with three new band members. It's the follow up to their debut album "Wolfmother" from 2006 and will be entitled "Cosmic Egg". A new song "Back Round" became available for download on their website a while ago. Other songs are "White Feather", "Violence In The Sun" and the title song "Cosmic Egg". Stockdale told NME that he is hoping the album will be out in September. They have been playing live gigs as "White Feather" to test the new songs.